Okay. I’ll go ahead and admit it- I am an absolute sucker for anything relating to teens and coming of age.. my obsession mainly stems from having a over-controlling, bi-polar mother (too long of a story) who wouldn’t let me enjoy/experience anything like the teen novels, TV shows, and stories of sleepovers I drooled over. It definitely stems from four and a half years of teaching as well. So when I have a terrible earache, have to work a few hours from home, and Clay has just introduced me to the wonders of NetFlix before leaving the house early on a Saturday morning.. I indulge. I’d never even heard of the show before, but thought I’d watch a few episodes to get my fix of teen drama. However, as you might have already guessed.. I fell into the trap. The pups were on my lap, the couch was sooo comfy, and the show was.. well, much better than I’d expected. 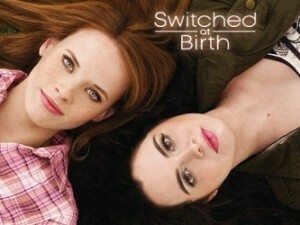 Switched at Birth. To make it super brief, two girls are switched at birth and the show sort of chronicles their journey getting to know each other, as well as shows perspectives from both families, etc. HOWEVER, one of the girls.. is deaf. Her friends are deaf. Her life is centered around.. well, deaf culture. First of all, I don’t consider myself close-minded, but I had never even considered, nor heard of the idea of a deaf culture before. I originally majored in Special Education in college before deciding to switch over to English.. so I knew a little, but not nearly as much as I learned. Although, I do know the alphabet and few words.. but I think everyone does! So I guess what made me watch 10 EPISODES this weekend (the whole first season, I know, shut up) is how interesting that culture is to me. How people without hearing deficiencies are referred to as “hearing”… how sign language is literally a language that needs to be learned in order to communicate with a deaf person. Yes, the hearing impaired can manage to read lips.. but the show brought up to the issue of having to convert to OUR spoken language.. when we aren’t making nearly as much of a effort to learn theirs. There is also sooo much more technology made to help the deaf than I ever knew about, including cell phones that will have interpreters sign (live) so that you can watch and reply.. which is pretty amazing. And then.. the world inside someone who is deaf.. how sensitive they are to everything visual: light, facial expressions.. I mean.. can you imagine? I listed to an episode of “This American Life” a while ago that featured a boy who had the cochlear implant and then decided to stop using it because his brain couldn’t adjust to all of the noise.. (prologue here). We take for granted a lot of the things we hear everyday.. dogs barking, the AC turning on, a blender, a chirp.. but I guess I’m still curious, I mean, what would it be like to hear nothing? I mean, really.. nothing? I have trouble clearing my mind at times because of my OCD of multi-tasking.. I should be reading, I need to do my laundry, I need to get to the bank before it closes.. so to lose the distraction of noise.. I mean, it just seems pretty incredible. I’m hesitant about even saying that because I am extremely fortunate to be as healthy as I am l and I wouldn’t wish the loss of hearing on anyone.. but I mean, really. WOW. So since I’ve decided that French isn’t in the cards for now (I’m considering applying to grad schools next year in Europe and once I find out where I get in, I’ll start the language for that country).. I’m pretty interested in learning about sign language. I’ll stick to YouTube and books for now.. but nonetheless I can’t stop thinking about how weird.. how utterly strange (and in some ways satisfying) it would be to not be able to hear.